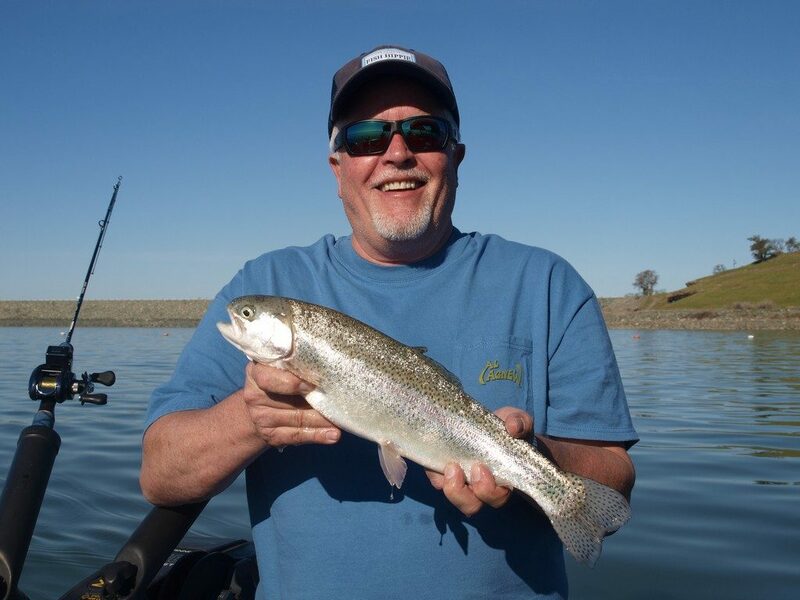 Lake Camanche is a beautiful foothill reservoir located east of Lodi near the town of Ione. It boasts 54 miles of shoreline and 7700 surface acres when full. John Brassfield of Auburn and I took a trip to Lake Camanche in the middle of March, and luckily hit the finest weather we have seen in Northern California for months! We launched John’s 18’ Duckworth at the north shore ramp on Friday afternoon, and headed east to the Narrows. The water was quite stained from all the rains, but still had 3 to 4 feet of visibility. We put out trolling rods with Speedy Shiners and Tasmanian Devil lures and started trolling at about 2.5 mph. We trolled up the mouth of the Mokelumne River and then trolled back down to the main lake. We saw several other boats fishing, but no one was catching. My Tasmanian Devil on the surface got hit 3 times, but the fish didn’t stick. Finally, John hooked and landed a fat 18 inch rainbow on a perch colored Speedy Shiner at 10 feet deep. We ran out to the Hat Island and dam area and found much clearer water, if no more willing trout. We headed back to the boat ramp just as dusk was starting to settle. It was a very short – 150 yard — drive up to our cottage located right at the top of the boat ramp. We settled into the lovely cottage that overlooked the lake from its large back deck. This cottage is ADA compatible, and features 2 bedrooms, 1 bath, and a large kitchen and living area. The kitchen is fully supplied with dishes, utensils, refrigerator, microwave and anything you may need to prepare a fine meal for the family. John and I relaxed on the back deck with cigars and bourbon and watched a beautiful sunset over the calm waters of the lake. Then we barbequed juicy rib steaks with baked potatoes and salad and then retired to our separate rooms to recharge for tomorrow. Saturday dawned clear and calm, and there were rows of trucks and boats coming in at 6 am. After brewing coffee, we jumped in the truck and were launching the boat in under a minute! We immediately headed toward the dam where we found the clearest water the previous day. I put out my favorite Tasmanian Devil – a UV Pink body that I custom painted with black and white wings. We had trolled only about 150 feet and I was still putting out my second rod when the clicker on the Daiwa Lexa 100 LC reel started screaming as the rod bent dangerously back towards the stern. The feisty rainbow jumped 3 times as he battled his way in toward the boat. 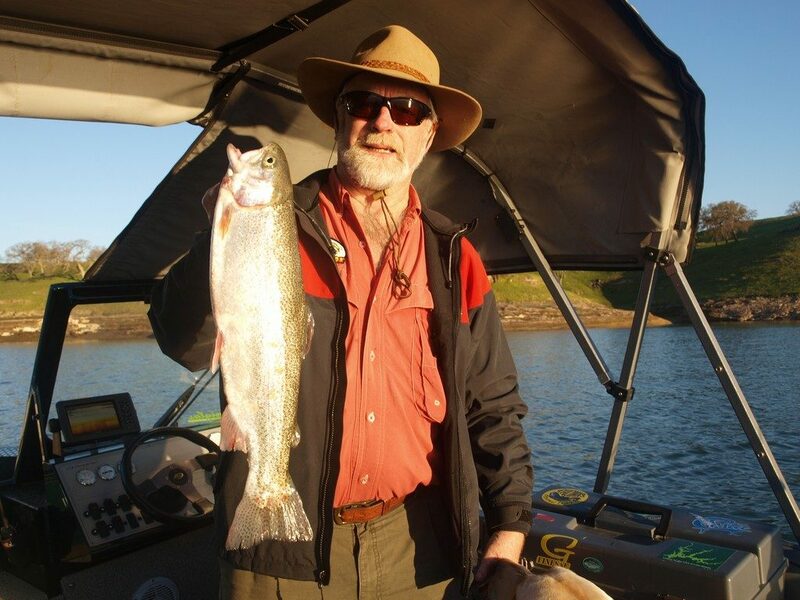 Finally, John netted a fat 19 inch rainbow! The water clarity was very good, so we stayed between the dam and Hat Island the rest of the morning. We ended up with 6 more rainbows from 15 to 18 inches. John caught 2 on a watermelon trout Apex on the Cannon downrigger at 13 feet. I caught 2 more on the custom Tasmanian Devil on the surface, plus a couple on a Hot Steel Rapala set at 10 feet on the downrigger. All our action happened before 10 am. We fished for 3 more hours with not a sniff, until we finally decided nothing short of dynamite could round up a fish when the bite was off! It was a lovely weekend on a great fishing lake! The weather was wonderful, up to 72 degrees in the afternoon, which we greatly welcomed after this long, wet winter. 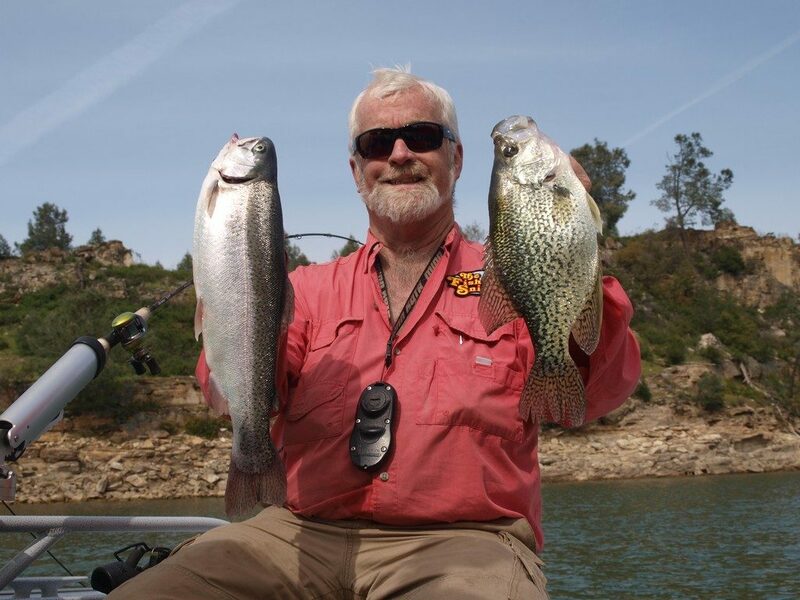 Lake Camanche is home to large rainbow trout, huge bass, and some of the largest crappie I have ever seen! They have a wonderful trout planting program from Mt. Lassen hatchery with quality trout put in the lake up to 8 pounds and more. Camanche Recreation has big, multi lane ramps at both the north and south shores of the lake, and lots of different kinds of lodging available. They offer 1, 2 and 4 bedroom cottages that can sleep up to 12 people, plus 150 RV sites, and over 500 campsites sprinkled along the shore of the lake. During the off season until April 30th, they offer Special Pre-Season rates that are a tremendous value. They also offer boat rentals with fishing boats, bass boats, kayaks, and pontoon boats that can handle up to 24 passengers. Both North and South shore marinas feature fully stocked stores for anything you may need, and the North Shore has a wonderful Café with delicious food and ice cream.